Let me tell you about the little game I play with my mind. For many years now when I am listening to an orchestra or band with many instruments in it I will try to pick out in my mind what instrument is playing at any given time. If I am not sure what that instrument is or if I find I am guessing I will turn my attention to single instruments to see what exactly they sound like played alone. U-tube is filled with instrumental solos. Then return to the orchestra with that sound-knowledge buzzing in my head and pick out the instruments. This little game I play keeps me interested in not only the arrangement of the piece being played but also gets me into the “idea” the composer had in mind when arranging it. Mostly though the songs that I have memorized are a variety of songs from artistes and bands that I have enjoyed and loved over the years. But it also helps me to concentrate better. Now if you are going to learn to play the piano by ear, piano especially, then you will need to pay attention to detail. In other words it is paramount that you grasp the melody with your mind first then transition it to the keys. Often this is not an easy task and especially when one has been trained to read music and that is all they have done. I have talked to many people who play the piano far better than myself but cannot go 30 seconds or even less, without the musical arrangement on the music stand in front of them. Do not be discouraged by this because you can accomplish playing your piano by ear without notes if you are determined and pay attention to the melody of the song as I said. You may have heard the term “transposition” which is a big word that simply means “the process of changing the key of a piece of music.” The fact is that most songs are easier to play in lets say the key of C where there are no sharps or flats to worry about. Well this is where transposition of the key the song was originally written in to the key of C. This is all part of learning how to play by ear. Rule of thumb, any major key can be transposed into any other major key or minor key. This good to remember and practice as it will help you tremendously when playing a song without notes. Sometimes you will need to transpose a song in order to compensate for the physical properties of other instruments to be playing along with the piano. At other times transposition is needed in order for the song to be easier to sing. I can tell you that once you catch on to the knack of transposing songs the reward is endless and so very exciting. It is such a pity to my mind when you see a wonderful piano player with years of practice and graded education who can play lets say Mozart’s Allegri’s Miserere for instance with sheet music but yet can not play the full version of “Happy Birthday” by ear. Aural Training (ear training) is absolutely vital for any musician and you can learn this. You just need to be brave and little by little it comes to the top of you repertoire. Another aid to this idea of playing piano by ear is repetition. Sometimes you will need to play a song over and over listening so very intently and picking out markers that will be reminders when going through the song on the piano without music. Another point of interest is that when you get a few songs down in your mind and are able to play these songs without the visual aids on your piano you will need to carry a list of these songs with you. I have a list of about 50 songs, titles only, that I have in my wallet. After a while, when your confidence has risen, you will be able to sit down to any piano in the world and play familiar music to anyone who has a listening ear. There are many public pianos. You will find them everywhere. In supermarkets, in hospitals, in halls, in Churches, in hotels….to name a few. Usually these pianos are just sitting there inviting you to play them and an audience may come around or it may not depending on the setting. One thing is constant though. 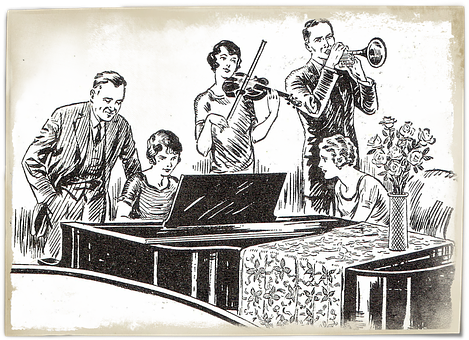 It is the fact that as you become more and more proficient with playing your music by ear in a spontaneous fashion in these type of settings confidence will come and you’ll be rewarded by the smiles on passer-byes faces as the recall the tune you are playing. Playing piano by ear is so rewarding to you as a musician. It seems to be the crowning feature to your accomplishments and hard work. I remember playing “The Way We Were” by Barbara Streisand one time. You may remember that great movie Streisand and Robert Redford starred in. The title of the movie carried over and was the same as that great song. It is one of the favorite songs. Anyway, I was upstairs on a balcony playing a Yamaha mini-grand over looking a very large supermarket below. I'm ALL ears....go ahead and teach me. It was a wide open setting. Suddenly a woman came very quickly up the stairs and over to me on the piano as I played. I had moved on to another song at this point by the time she got to me and she broke right in and with tears in her eyes she said, “Can you please play “The Way We Were” again. That song has so much sentimental memories for me.” She went on to say, “It is the music my Dad and I danced too for the first song at my wedding. Now he has passed and that song reminds me so much of that wonderful night.” So I did and she was thrilled and tears flowed. You see, it is times like this that you can see the worth of playing a piano without notes and make a connection with people because everyone carries around in there head several favorite songs. Ive played piano by notes for a while now, after reading this I am now curious by learning to play by ear! I’ve tried playing by ear before and it was more fun but it was just harder to play that way. I never thought it was worth playing by ear but I can see that it probably sounds less “robotic” and more emotional. Thank you for your reply. Yes, I agree with you that playing by ear can be much more emotional but I suppose it depends on the piece of music or song. For instance, I have always been a fan of the Beatles and they have recorded some of the most beautiful love songs the world has ever known. When playing for instance “Yesterday” or “Hey Jude” or “The Long and Winding Road” etc. by ear one tends to ponder the melody. It always amazes me to see person that can actually learn the musical instrument from ear. Now for many they have to go to school and then there are those who listen and the rest is history. I believe that this is and amazing gift from God. Your post is amazing with good information. I know that your readers will love what they are hearing and what you are offering. Thank you, Norman. I hope my readers will be encouraged by my blogs as well, of course, and I agree with you that there is a certain mystery involved as to how some people can listen to a tune and then play it without notes. That is a gift….but there are those who work diligently at playing a song by ear but will get it if they don’t give up real easy…..Duane. Newer PostHOW DOES PLAYING THE PIANO HELP......THE BRAIN?